ATLANTA, October 15, 2016 – The sister companies Ceto and Associates and CetoLogic teamed up to raise funds for JDRF, which is the leading global organization funding type 1 diabetes (T1D) research. JDRF exists for the millions of children, adults and families affected by this disease. The foundation’s strength is their exclusive focus and singular influence on the worldwide effort to stop T1D. 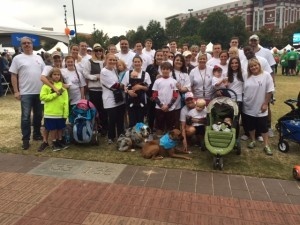 In addition to fundraising, the companies participated in the Atlanta JDRF One Walk. The walk helps create awareness and a world without type 1 diabetes (T1D). The companies had 50+ walkers, and team donations of over $2,000. The companies matched that total, allowing Ceto and Associates and CetoLogic to donate almost $4,500 to the cause! The firm’s donation to JDRF was in honor of Haley Locklier. Haley was diagnosed with Type 1 diabetes at the tender age of 2, she is now 24 years of age. Haley is the granddaughter of Nicholas Ceto Jr., CEO of Ceto and Associates, and the niece of Douglas Ceto, President and CEO of CetoLogic. “There are many great charities that need financial assistance to continue to do their good work. However, one of my favorites is JDRF. Through the contributions of many people, for many years, the results are paying off! There are breakthroughs almost daily that will soon result in finding a complete cure. I am the grandfather of a Type 1 diabetic and I pray constantly that a cure is found, not only for her, but for the hundreds of thousands of others just like her. I will continue to do all that I can to speed this process along,” said Nicholas Ceto Jr., CEO of Ceto and Associates. “The research being done today and the advances that have been made are directly related to the efforts of everyone who participates in walks like these. CetoLogic is proud to be part of such a great cause, and Haley has touched and inspired so many people with her determination and “never give up attitude.” We love you Haley for all you do for others and JDRF."